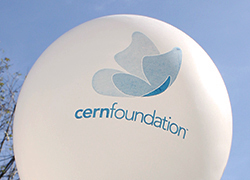 These white balloons feature a blue CERN Foundation butterfly symbol. This order comes with 25 latex balloons for $25. You can create your own Ependymoma Awareness event and use the balloons to draw attention to the cause! International (outside the U.S.) shipping fees are not included in the item price. These additional charges are the buyer's responsibility.